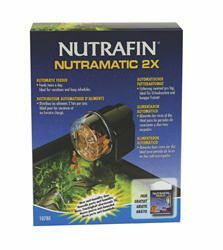 The Nutrafin Nutramatic 2X Automatic Feeder provides flexible installation options which allows for rim and free-standing positioning while fitting within some canopies. This easy set unit distributes food at two intervals during the day and features food quantity adjustment and anti-humidity door to protect and maintain food quality. Flakes, granules and pellets can be used with this automatic fish feeder.